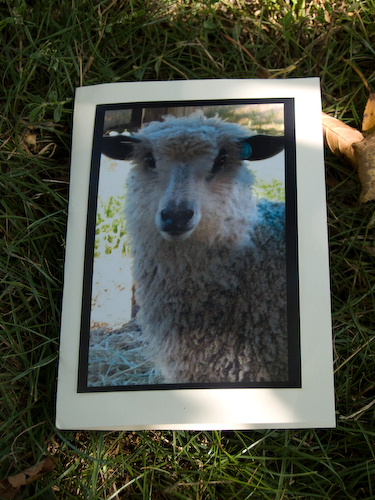 Lois sends her wool to several different mills for spinning; two in Michigan and one in Vermont. The 2-ply sportweights (“sportweight” appears to mean something different than I’m used to: heavier than DK rather than lighter) by Stonehedge Fiber Mill (second and third from top left) grabbed my attention first. They’ve opted for a loose, low-twist structure, so the long, shiny fibers of the Wensleydale wool are displayed at their softest and most glistening. The other Michigan company, Zeilinger Wool Co., has gone a very different route. 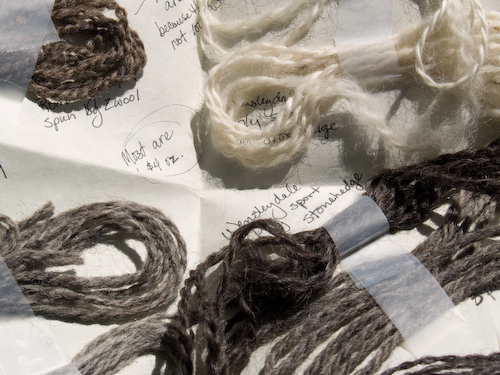 Their yarns (at left and lower right – some are 100% Wensleydale, some are blends, and the brown at upper left is 100% Romney) are dense and heavily twisted. They’re rougher and stiffer to the touch, but Lois says they’ll bloom when washed. They’re mostly bulkies and seem to beg for a thoroughgoing cabled project. The yarn peeking out in the extreme lower right is processed by Green Mountain Spinnery. The singles are more tightly twisted than Stonehedge’s, but they aren’t plied as tightly as Zeilinger’s. These, too, look like they’d soften and bloom. Only one way to find out, right? I only have about a yard of each, but I’m going to try to knit up some mini-swatches. I’ll show the results here in a couple of days! I’m already thinking of that darkest Stonehedge Wensleydale as an Amanda cardigan from Lisa Lloyd’s A Fine Fleece. What would you want to knit with wools like these? I would love to knit something out of a Fine Fleece – Fylingdales really looks great. Or something else with a shawl collar and some cabling? Zeilingers is about 1.5 hours from me – unfortunately it is in a crazy little town called Frankenmuth that has Christmas shops and fudge shops galore. I don’t have any experience with their yarn, or yarn they have processed, so I am sorry I can’t give you more info! I just keep picturing a lovely, rustic blanket. Something you could snuggle up in, and maybe a sort of ombre pattern, going from the darkest to the lightest yarns, in garter stitch. I’m knitting my CPH out of a local Michigan wool, a nice mule-spun organic merino/rambouillet mix, and I love it. The cables match so well with a more rustic, natural yarn. I think I’ll join your knitlocal Ravelry group! I’m thinking Staghorn from A Fine Fleece. When I first saw the samples, the book A Fine Fleece immediately came to mind. Beautiful yarns. Please continue to share any other yarn fiends and the results of your blocking efforts. These are a great start! For natural-colors yarns like these, I’d want to make something traditional with a bit of a modern twist. Probably something that could be worn as outerwear in our climate. The cabled riding jacket from loop-d-loop and the Veronik Avery sweater from the new Vogue knitting come to mind. Oooh, beautiful yarns! I keep meaning to pick up A Fine Fleece, but still haven’t done so. I can definitely imagine these yarns working really nicely for one of that patterns in that book. Way Cool! I had no idea you were going to knit these up and review them. I would have sent more of each for you to try out. Isn’t it interesting that each mill processes the SAME fleeces a different way? I am slowly trying different mills, but it’s a slow process since most of the mills require 50- 100 lbs. to make yarn. That’s a lot of my fleeces that could have been made into roving, what we REALLY specialize in. Luckily my sheep have to be sheared twice a year, so there’s always more coming on the hoof! If others of you have any experience with other mills making your wool into yarn and want to recommend another mill for me to try, please email me!